Dixie May and Daisy May are sisters from the same litter. We contacted our breeder, Solid Rock Goldens, in North Carolina to let them know that we wanted to adopt a future mama for our Wine Country GOLDENdoodles. They told us about two sisters who were extremely beautiful and sweet tempered but that they were so attached to each other that it would break their hearts to split them up. Long story short we adopted both of them and they do love each other VERY much. They play together, groom each other and cuddle together constantly. They are very special dogs. 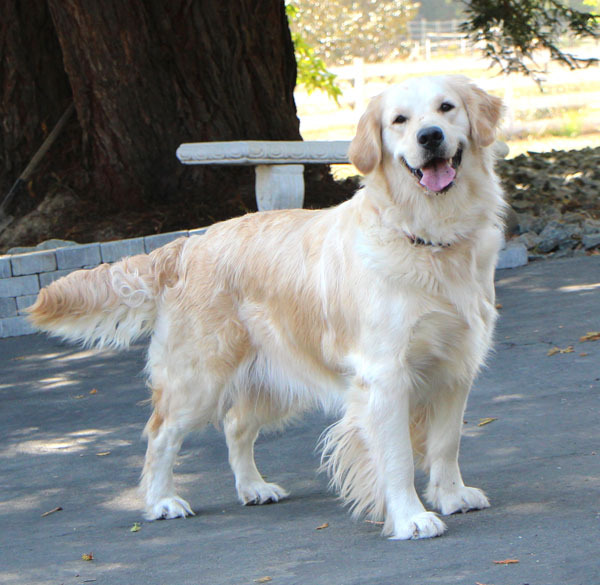 Dixie and Daisy are full English Cream Golden Retrievers like our Maggie May and Surrey Bear. They are extremely light in color and their hair is very soft and lush. Dixie and Daisy have the same dad, “Prince”, Strong Stael Shandy Shon, as our Maggie May. “Prince” is the son of an international grand champion and has a very strong lineage of champions. Dixie and Daisy’s mom is “Holly”. Holly’s mom was “Cara” who was also our Maggie and Romie’s mom. Holly’s dad was “Bear” who was our Surrey’s dad as well. Holly’s 5 generation pedigree is almost completely filled with champion/titled dogs. Both parents of Dixie and Daisy have had their eyes, hips, elbows and hearts cleared. Dixie and Daisy have had their testing done as well and have passed with flying colors! Our twins “Daisy” and “Dixie” look very much alike. They both have that wonderful stance and the much desired “Teddy Bear” blocky head. Their coats are very thick, a light creamy color with feathering. They have beautiful eyes and nice dark black noses. Their conformation is textbook. Both Dixie and Daisy are very submissive and have very gentle dispositions and are eager to please. They both give lightest, sweet kisses. They both love people, of course and are very smart! They are a joy that is for sure. 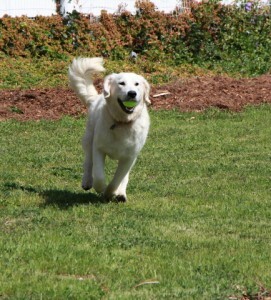 As is tradition with getting our Mama’s from Solid Rock Golden’s Dixie and Daisy are definitely Golden of Goldens. We welcome them to the Wine Country GOLDENdoodle tradition! “Ellie” is a beauty. 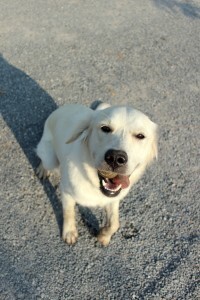 She is an only dog in her home and gets lots of training and love from her guardian family. She has had her health clearances completed. She also has multiple generations of health testing in her lineage. Ellie’s sire was Strong Stael Shandy Shon AKA “Prince” and her Mama is Marvelous “Misty of Solid Rock”. Ellie is English Cream and has many champions on both sides of her pedigree. Ellie is extremely smart and has an extensive vocabulary. She loves to go for car rides. One day Ellie’s human mom Kim casually said “Ellie go put dad’s slippers away in the bedroom and I will take you for a car ride”. Ellie looked at her, looked at the slippers in the front room and then immediately went over got the slippers and brought them to the bedroom. Ellie also loves to dive. She has a pond at her house and swims under water and loves it! Ellie has a boxy face and intelligent eyes. She is a light Golden and her feathering looks like spun silk when brushed. 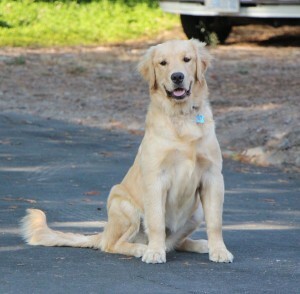 We are thankful for another solid Mama Golden who is smart, beautiful & sweet as well. Korah, true to form, has a very square, teddy-bear face. She has a very light, very soft coat with beautiful feathering. Korah has all of her veterinary clearances and is ready to be bred. Her eyes, hips & heart have all been tested. The vet commented that her hips were “excellent”. 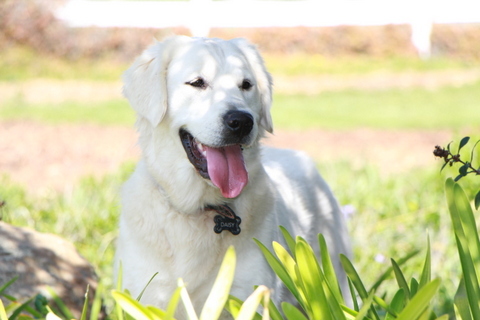 Korah’s doggy parents were Gold-Rush Captain of Snow Camp and Lily of the Valley of Heritage Rock. Both parents had completed and passed all of their tests as well and have many champions in their lineage. 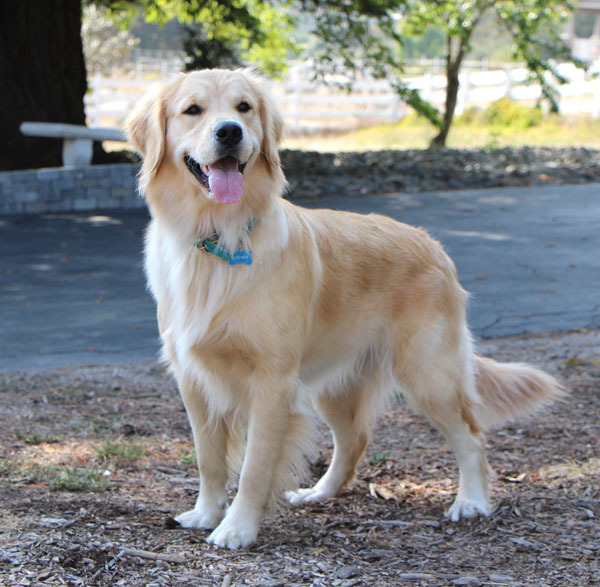 Korah lives in a guardian home in nearby Petaluma. Korah is a head turner and has a wonderful disposition as well. Korah is well mannered and very gentle. Her disposition is excellent – maintaining that Golden Retriever reputation. She loves to go on long walks with her mom. All of our mama Goldens come from a very reputable breeder on the East Coast and we are once again happy with what we have been blessed with in Korah. She is beautiful inside and out. Deja is absolutely gorgeous! She belongs to great friends of ours Louise & Darryl and they spoil her rotten! She has a great life and definitely loves retrieving tennis balls! Deja is smart and lots of fun too – a perfection combination not to mention how beautiful she is. Her dad is Gold-Rush Captain of Snow Camp and her mom is Gracy Me My Lady LL. 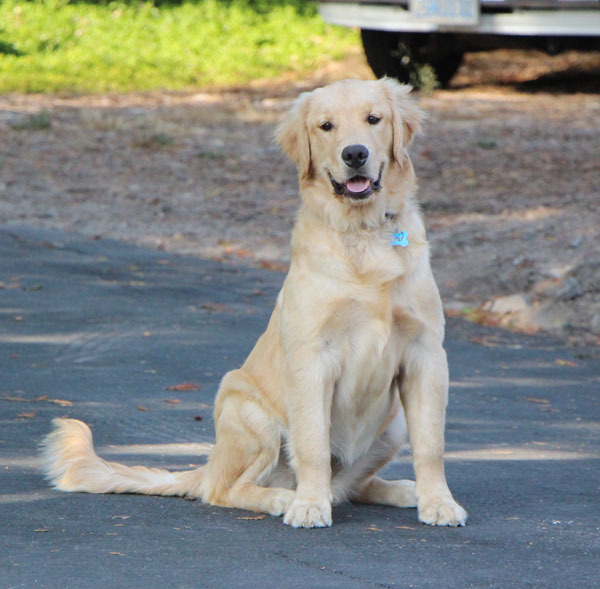 Like the rest of our mom’s she is from the East Coast – Solid Rock Goldens. It is not surprising that all of her health testing came out very well given that her lines were filled with very good test results and championships as well. We love her teddy bear face and her soft hair. Deja is very good with children and is incredibly sensitive and gentle in nature. Just a very well rounded dog in every way. Deja loves to sit like a frog and does so very often. She also loves to lay on her back and have her tummy rubbed nightly. This makes perfect sense if you consider that her guardian mama is a massage therapist! Lucky Mama. Bella is the sweetest things you ever laid eyes on. All of our Mamas are amazing and these girls definitely fit into that category. Bella is not only a beauty but also has this very very submissive, gentle disposition. She has been very calm from the time she was a puppy and seem to just be super laid back. She is smart and just wants to please. Of course Bella comes from Solid Rock Goldens – clear across the country but well worth it. Their dad is Gold-Rush Texas Ranger and her mom is HR Love that Girl Annie! Both parents have all of their health clearances and as usual there are a myriad of championship in both their lines. Bella has the very desired European blocky heads. Their coats are very lush and thick and a gorgeous golden color with feathering. Their eyes are very pretty – with gorgeous black eye liner that frames them in perfectly. Their confirmation is textbook. We could not be more pleased with the very loving Bella!